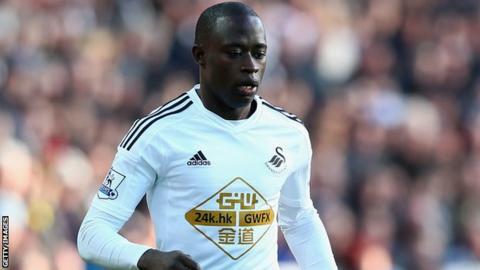 Blackburn have signed striker Modou Barrow on a three-month emergency loan deal from Premier League side Swansea. Barrow has made 13 appearances for the Swans since signing from Swedish side Ostersunds in September 2014. The 22-year-old had a loan spell with Rovers' Championship rivals Nottingham Forest last season, but failed to score in four games for the club. The Gambian forward could make his debut for Blackburn in their League Cup tie against Shrewsbury on Tuesday.